My children are as happy and excited to go to school everyday as I am to send them. It’s the one thing in life we all agree on. We have reached this consensus because I know they are going to be educated and challenged while having fun in a safe environment. They know they will have a great time. It’s all good. And of course the people who so cleverly pull the wool over their innocent eyes are their fabulous teachers, who make learning so much fun my kids don’t even know it’s happening. 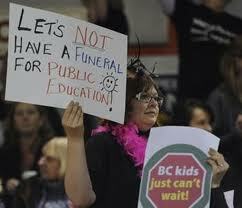 Children across BC are not in school today because the teachers are on strike. They are striking not because they want to, but because they felt they had no choice. Teachers are already between a rock and a hard place due to funding cuts, and government-mandated larger class sizes will make it difficult to do their jobs properly. There are other issues at hand, and I don’t profess to know all the ins and outs of the dispute, but this I know: two characters, the union, and the government, are refusing to compromise. Within this cast, the union is being represented by an unwieldy woman who sounds like a battleax. The government is being represented by a man who speaks in monotone, and sounds more robotic than human. Both are difficult to sympathize with, and I don’t particularly like either of them. These caricatures are getting in the way of my children’s education, and are getting in the way of our teachers doing what they do best: teaching. Like gang warfare, the two loud, obnoxious leaders are trying to settle a dispute that goes back a long, long, way, and our children and teachers are caught in the crossfire. I do know a few things about teachers, having three children in the public education system for the past eight years. They each bring different, unique gifts to their job: some are more creative, some assign more homework, some are more into math or reading or athletics than others. But what they do share is a passion for their jobs, a belief in what they do, and love for our children. They share an ethos of hard work, and they know this hard work will pay off as the next generation goes forward. They don’t get paid well enough for all the crap they have to put up with between the parents, the union, and the government, but they teach anyway. It is their gift to society. Every year, my children have been lucky to have not just an average teacher, but one that is phenomenal in different ways. Every year, their teachers surpass our expectations. Every year they improve my children, and mold them into better beings. Every year, I hold back tears (well, I try; occasionally I weep openly) when I thank them for their enormous contribution to my children’s lives. Every year. That’s quite a talent pool. In my random performance evaluation, I give our teachers an A+. It’s too bad the union and the government can’t perform their jobs nearly as well. In a world where nothing makes sense, all we can do is hold each other together. I think of you and John everyday, and you know how much I adore you. Cant’ wait to see you in July. Gosh, sorry to hear the teachers are on strike–that the union and government seem to be at such an impasse. At the same time, it’s fabulous that your kids have had such amazing teachings. You are such a good parent, Deanna, and great citizen, as well. Have you thought about reworking this post as an op-ed? You are such a great cheerleader. I’m sure I would get a lot of flack for an op-ed piece that describes someone as a battleax…I think I prefer the smaller, more intimate audience on my blog. We are lucky to have amazing teachers, that’s the bottom line, and it’s so much easier to support these gifted professionals, rather than the faceless government. Things I Wish Someone Had Told Me About Motherhood Does Labeling Kraft Dinner ‘Smart’ Make it So?